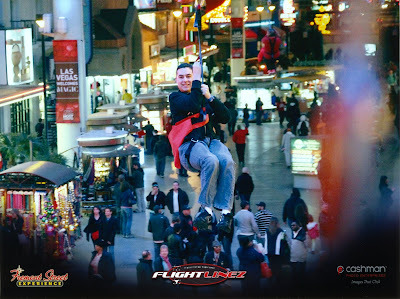 Every year, maybe every other year, Jenn and I head down to Las Vegas. There’s always something new to check out and it’s a fun place to visit. Normally we kind of do the same stuff – we run ourselves ragged walking up and down the strip trying to see every hotel and visit every shop. What we’ve found, though, is that while we tire ourselves out, there’s not that much changing (it changes fast, but not that fast) so we haven’t actually seen a lot of new stuff. This time we decided to make a point to both not walk our feet off and see new stuff we’d not seen before. Only downside to the Fremont Street thing is how far away it is from the strip. We took a taxi and it was like $25 each way (not counting tip). If you plan on checking that out, you either need to figure out public transportation, rent a car, or actually stay down there. 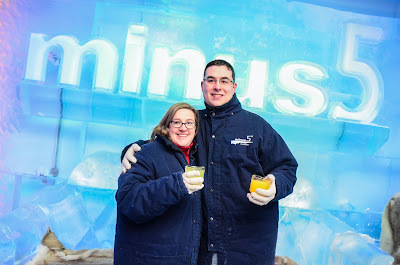 Another thing we did that I wanted to do since last time we were there was check out the Minus 5 ice bar. The whole place is a big freezer where the walls are lined with blocks of ice, the furniture is made of ice, and even the cups you drink out of are ice. It is, as you can imagine, totally freezing in there. Like, you get a parka and some gloves along with your admission, but even with that you start to go numb in your fingers and toes after a while. You have to set your drink down on a neoprene coaster, too, since the cup and the table are ice and your cup will fly right off like an air hockey puck. (We played with that for a while.) There are sculptures and things made out of ice to check out, and there was a cool little “living room setting” made out of ice where they had a fireplace (the “fire” was a decal frozen in the ice) and on the mantel were a bunch of books – all frozen in a block of ice. It was fun and pretty novel. We ate at a couple of new places (the Wicked Spoon buffet is a new favorite), and we visited some of the same stores, but for the most part, we otherwise just really took it easy. We actually did accomplish our goal – not walking our feet off and trying a bunch of new stuff. It was good to get home and sleep in my own bed… but I could stand to go back in a few months. I always have a good time. Here’s the full photo album in case you’re interested. Lots of decorations all over for Chinese New Year. « Can You Run Visual Studio in Azure?